This magnificent dollhouse is only framed in my workshop, ready for you to select colors and finishing style for the inside. There are three floors, twelve rooms, 55″wide x 26″ deep x 37″ high. This picture shows a Rosedawn Planation dollhouse finished that I sold to a customer several years ago. Hello! Your Dollhouses are incredibly beautiful! I have a Rosedawn Plantation kit that I got more than a decade ago. I was hoping to work on it with my husband, but life has sort of gotten in the way, and I would like to have it built for me. Well the mansion is built, it just needs the siding, roofing tiles, glass windows, etc, to be done. Any information would be greatly appreciated. I live in Massachusetts. thank you for your time. Your dollhouse kit is a beautiful style house. Please give me a call on my cell phone to discuss your project. 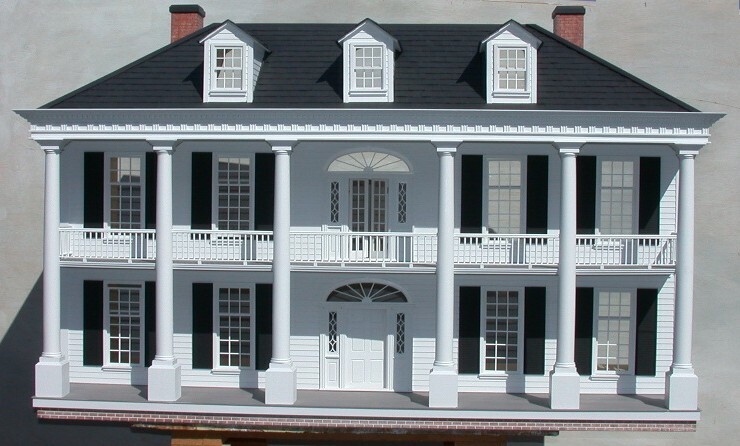 I did not hear back from you about finishing your Rosedawn Plantation Dollhouse kit. I build for customers all over the USA and I have been a master dollhouse builder for 28 years. Please give me a call on my cell phone 203 768-3816 to discuss your project. Hi Katharine, do you still need your Rosedawn Plantation kit finished? Give me a call 203 768-3816, Rick Maccione owner of Dollhouse Mansions, Woodbury, CT. Please give me a call on my cell 203 768-3816 to discuss the Rosedawn Plantation house, what is completed and if you want anything else done. You bought one of the most beautiful dollhouse kits on the market. Send me an email at dollhousemansions@gmail.com and I will look for the information to help you with the missing parts. Is this dollhouse still available for purchase? I am the Executive Director of a non-profit (Orphan Care Solutions of Texas http://www.OrphanCareSolutions.com) … we are a clearinghouse/bridge to assist The Church in collaborative solutions for our state’s foster children. We will be the beneficiary charity for the Montgomery County New Year’s Eve Masquerade Ball. I was thinking we might get a doll house we can call “Sheltering Hope” and auction it off to help fund our “Hope’s Path” independent living home/program (www.HopesPath.org). The perfect house needs to be Texas large (hahaha) … farmhouse … and has to be worthy of front page newspaper article for the Houston Chronical. (They always feature the #1 auction item with it’s winner.) I will need a lot of help, as it will have to have to be fully completed with lighting, furnishing and here by December 28, 2016 … but we would like to put progressive photos of you making it if possible. Please call my cell 202 768-3816 to discuss your project. I was curious as to the cost and shipment of a dollhouse from your site. I have three little girls that would love a new wooden dollhouse. Please call my cell 203 768-3816 to discuss exactly what you want included in the dollhouse, for I could give you an estimate of cost. I can build over 200 different dollhouses in any SIZE, STYLE and PRICE. Do you have photos to show the inside of these beautiful dollhouses? Hi Mary, please tell me which dollhouses you are interested in and I will see if I have or can get pictures of the inside. It would save us both a lot of time if you would call my cell phone 203 768-3816 and we can talk about some of the dollhouses you might like. How do I go about purchasing one from you? Please send me an email to dollhousemansions@gmail.com and I will send you some information and details about that dollhouse. Right now I only have the dollhouse rough framed in my workshop.